Dating back to the 1880s, the Hotel Monteleone is one of the most popular hotels in New Orleans, with its world-famous Carousel Bar, imposing Beaux-Arts style design and list of famous guests including authors such as Tennessee Williams, William Faulkner and Ernest Hemingway. 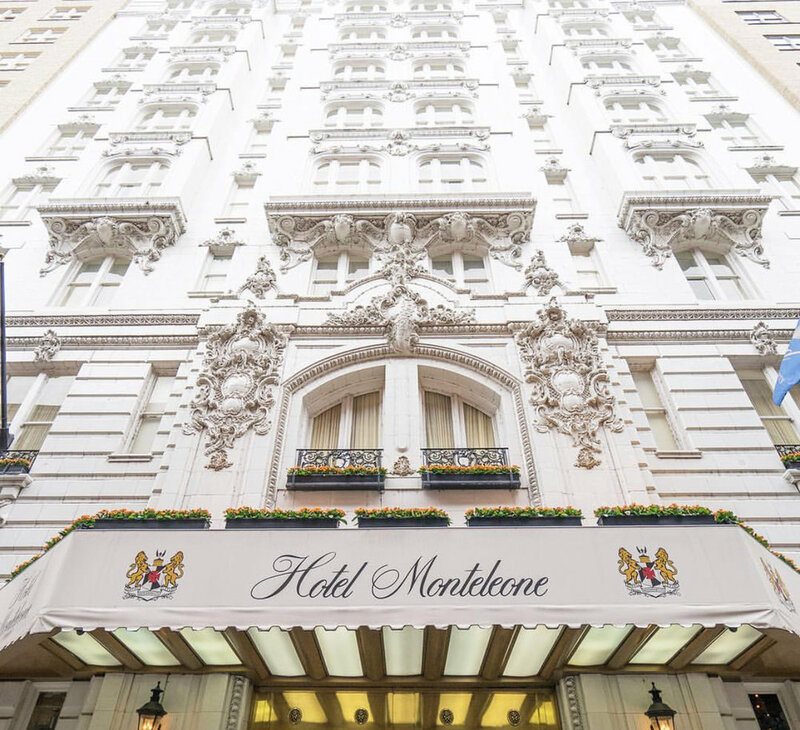 But while the Hotel Monteleone exudes luxury and timeless elegance, the Monteleone is home to a number of spirits that remain permanent hotel residents. One ghost that is said to remain at the hotel, wandering the halls, is a former employee named “Red.” On the hotel's 13th floor, a number of children that died in the hotel from yellow fever have frequently been seen and the ghost of a little boy named Maurice Begere still likes to play pranks on the 14th floor. According to people who have worked for the Hotel Monteleone, the bar is a favorite spot for ghosts to appear, and quickly disappear. Also called the Sultan’s Palace, the Gardette-LaPretre Mansion has an unusual history. According to the most popular lore, back in the 1800s a mysterious man with ties to the Sultan of Turkey came to the French Quarter and rented the mansion from an impecunious Jean Baptiste LePrete. He, as well as his harem of women and servants, moved in and lived a life of luxury with extravagant, all-night parties and the finest accoutrements. One party, however, ended on an extremely tragic note with a mass murder. All the guests were slaughtered and the Sultan was found buried in the backyard. Paranormal activity at the location includes the screams of those that perished at the party as well as claims of a Civil War soldier haunting the mansion. Today, the Sultan's Palace is still a private condominium, which means that it is off limits to tourists or visitors, but you can still snap a few photos of this infamous building. The Pharmacy Museum is one of the most popular tourist stops in the French Quarter, as it filled with medieval medical contraptions, and other relics from the past. But, more horrifying than the items you’ll view at the museum are the ghost stories that are told about the historic pharmacy. In 1816, the first fully licensed pharmacist in the city, Louis Joseph Dufilho, Jr., opened a pharmacy which sold a variety of medicines and voodoo potions. As the years passed Dufilho quit the business and sold it to Dr. Dupas. Lore claims that Dr. Dupas liked to do an assortment of experiments on pregnant slaves with unusual and tortuous tools such as bone saws. Dr Dupas's spirit has been seen with the greatest frequency, with books being thrown, display items moving on their own, and alarms going off. Other spirits are of two children often seen playing outside. The children are believed to be related to Dufilho as two of his children passed away in the building. Located on Jackson Square, Muriel's was once the home of Pierre Antoine Lepardi Jourdan, who bought the property sometime after the devastating Good Friday fire of 1788. Jourdan stepped in and set forth restoring the home to its former glory. Despite rebuilding after the fire, it is said that in 1814 he wagered his home in a poker game. After losing the house which he lived most of his life in, the house he spent a fortune restoring and renovating, he fell into a deep depression. He committed suicide on the second floor in the area that served as the slave quarters, the same area where Muriel’s Seance Lounges are situated today. Pierre Antoine Lepardi Jourdan still seems to be haunting Muriel’s today and is probably the most frequently encountered ghost on the property. People have heard a woman’s voice as well as knocking on the walls during some of these séances. Other patrons and employees say it is not unusual to see things flying through the air both inside the building and outside in the courtyard. One irate spirit enjoys shattering glasses against the courtyard’s brick wall. The LaLaurie Mansion is widely considered by many to be the most haunted house in all of New Orleans. Shows like American Horror Story have made an already infamous location that much more notorious. The house was built back in 1832 for Dr. Leonard Louise LaLaurie and his wife, Delphine LaLaurie, who infamously became as the 'Cruel Mistress of the Haunted House.' It was no secret that the LaLaurie’s owned a number of slaves. In 1834, a fire broke out, not only destroying part of the house, it also brought to light seven slaves who were starved, tortured and chained in the upper part of the building. For almost 200 years, there have been reports of paranormal activity coming from this house. It shouldn't surprise many that a lot of the hauntings can be traced back to the slaves that Madame LaLaurie kept on the property. Reports of moaning coming from the room where the slaves were kept are common. Phantom footsteps echo through the house with regularity. Many people who have stood near the house have reported feeling as if they were taken over by a negative energy. Whether or not you believe in any of this is up to you, but one thing’s for sure, New Orleans is full of exciting history and intriguing legends. Let us know if you're brave enough to experience haunted New Orleans in the comments below!